Imagine pulling up to the valet at a luxury five-diamond resort overlooking the Pacific Ocean. What could be better? Oh yes, having your favorite furry pal with you! 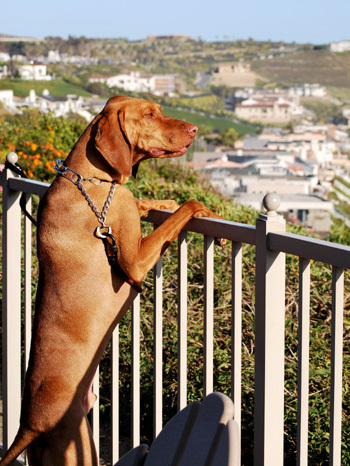 This fantasy is reality at the Ritz-Carlton, Laguna Niguel in Orange County, Calif. Not only are all well-behaved dogs welcome overnight (all breeds, all sizes), but every month, canines and their companions are invited to the property for Yappy Hour. 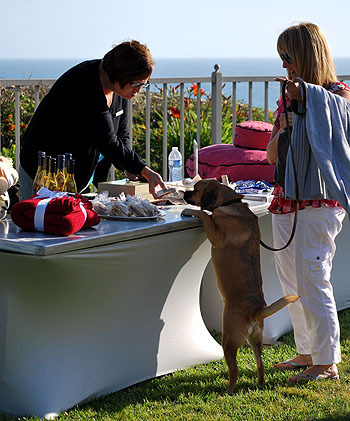 This lively cocktail party on the resort’s lawn features free flavored water for the dogs, as well as chef-made biscuits. For human companions, there’s a no host cocktail bar, wine from Mutt Lynch Winery and hors d’oeuvres, with proceeds benefitting the nonprofit Pet Project Foundation. Our friends at the Ritz-Carlton shared their secret recipes for the delicious flavored water that the resort’s four-legged guests just can’t resist. Which flavor will your dog love best? Method: Roast chicken carcasses, then add to stock pot with everything; pour cold water over and simmer for 4 hours. Strain, chill and serve up to doggies!! Method: Bake the bacon, cool down and drain off all fat. Add to stock pot with everything. Simmer for 3 hours, strain and chill. Once chilled you will have a fat layer on top. Remove this fat and you will have a clear, flavorful doggie water! Method: Roast beef bones; when it starts to get golden, then add your veggies. Roast all together for about 15 minutes. Pull out of oven and add your tomato paste at this point; put back in oven for about 5 more minute until it starts to smell sweet from the tomato paste. Add everything to a stock pot, pour cold water over (cold water keeps your dog’s water clear), and simmer for 4 hours. Strain, chill and serve up to doggies! Oh, I love this. My dog would be in absolute heaven. Maybe I’ll try some of these flavored waters for him to recreate at least part of the experience. @annedreshfield Sounds good, let us know how your dog liked them! @mellonz We know! We all want to bring our furry friends there. The chicken and beef flavored waters are known as chicken stock and beef stock in the culinary world. There are recipes in most cook books (leave out the salt and pepper) and if you can’t cook you can get almost the same result with a bouillon cube just use less bouillon per water. @Her_Benjamom Thanks for the tip!